Use this book to help with composition, speaking, clustered vocabulary and grammatical form study, English vocabulary building, and more! An article has been written about Christine Meyer and her book Latin Synonyms for Language Lovers in her local newspaper. Read the article. 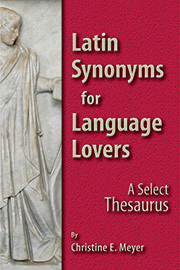 In Latin Synonyms for Language Lovers: A Select Thesaurus, author and highschool Latin instructor Christine E. Meyer has compiled an impressive 280 page compendium offering word listings of Latin synonyms grouped by English definitions and parts of speech, with each individual entry offering multiple Latin vocabulary options thereby enabling students to select and differentiate between similar words. This skill allows those students to utilize Latin as a living language. Enhanced with twenty-two images, an appendix of Latin expressions, and two indices, Latin Synonyms for Language Lovers: A Select Thesaurus is thoroughly "user friendly" and very strongly recommended as a core supplemental addition to Latin Language Studies curriculum materials. It should be noted that Bolchazy-Carducci Publishers is a premier publisher of instructional materials for Latin Language Studies and have an extensive roster of their publications on their web site at www.bolchazy.com.